Denny Jump (Bellevue, WA, United States) on 21 October 2011 in Landscape & Rural and Portfolio. 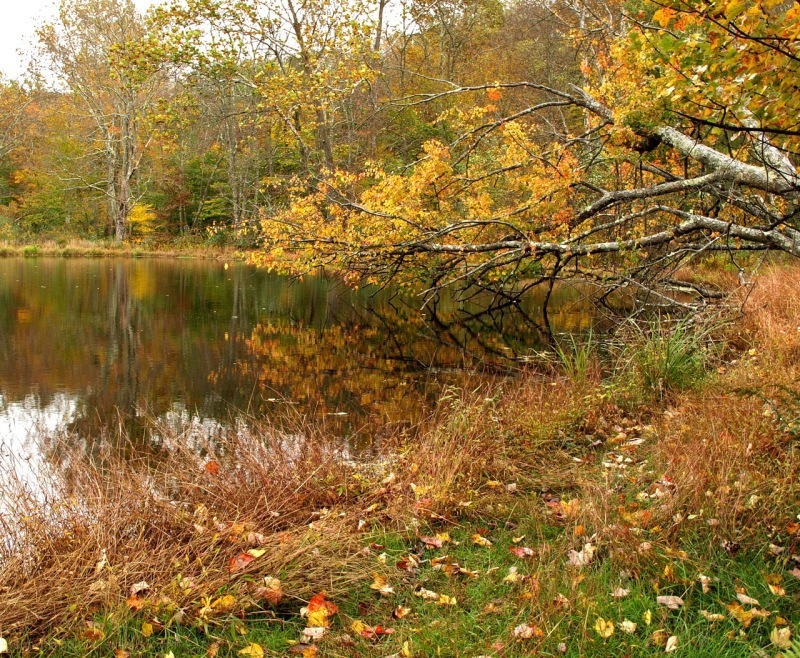 Here is a scene from one of the many small pond areas located in the Delaware Water Gap N.R,A. ("N.R.A." stands for "National Recreational Area"). The Park is about 40 miles long and about 15 miles wide. It includes a lengthy stretch of the Delaware River, which serves as the border between New Jersey to the east and Pennsylvania to the west. Referred-to simply as "The Water Gap," by locals, this is a very heavily visited area. Yet, it does not enjoy full "National Park" status. The Water Gap's proximity to New York City, Newark, Northern New Jersey and Western Pennsylvania (where I live) makes it one of the most visited National Recreational Areas anywhere (the 19th most visited National Park or Area, as a matter of fact). Someone living in Manhattan can actually be on a trail, in the silence of nature, within 90 minutes (quick by US Standards ;-) and sometimes even less)! There are scores of trails, streams, waterfalls, and marshes throughout the area, as well as the beautiful Delaware River, of course, which is a protected river. Additionally, a 25 mile segment of the famous Appalachian Trail passes through the Water Gap on its approximately 1,100 mile journey stretching from Georgia to Maine. In the fall, the visitation numbers grow exponentially, it seems. This year with the dramatic fluctuation in temperatures, excessive rain, forocious winds, two tropical storms, and one hurricane that we have received, many of the trees, here, have simply lost their leaves. Nevertheless, there still are some "pockets" of colour, making them all the more precious upon discovery. what a wonderful place!! gorgeous reflection, gorgeous colors, beautiful composition!!! It is interesting to have the tree stretch over the water, very nice seen! Beautiful autumnal colours, the reflection in the water is lovely. Still very spectacular, in spite of what nature threw at the trees this year. Lovely picture of an area which does'nt seem suffering tto much of these visits. Wonderful autumn colours. Great capture, great composition. Well seen, Denny. The beauty of nature is quick to recover from storms and bad weather - but not always from human intervention. A lovely stretch of water that deserves to be a full National Park. Beautiful golden autumn colors and nicely framed including the downed tree touching the water! Great shot! Denny this is beautiful very vibrant yet very subtle. The reflection is sublime as it blends in. I love the curve of the shore throughout the frame. Thanks too for an informative description of the place. Love the text and the image, Denny. The curving shoreline is a nice bit of framing. A beautiful fall scene with the fall colors and the water. Nice one. Beautiful scene Denny - despite the less than stellar conditions, the colors are beautiful here. You think that fallen tree is from the hurricane or has it been like that for a while? Incredible scene here, Denny, I could wander, lost in this photograph for a long time. The colors, the textures, the reflections, all are wonderful. Thanks for sharing. Gorgeous autumn scene and I love the reflection! Looks like a wonderplace to take a walk! Beautiful colors and reflections captured in this compo, Denny! Such a serene place to be given that there is no one in sight and the water is so calm and still. Fine tones and colors. The reflection is great. Two thumbs up. Such beautifully soft colors, Denny ... in such a gorgeous area. I thought you were in eastern PA near The Gap, but in your narrative you stated otherwise otherwise? Idyllic location and a beautiful point of view. Nicely approached. Looks like fall is in full swing in this area...Nice image Denny ! This photo is absolutely gorgeous! The colours are sooooo beautiful. I especially like the reflection of the leaves in the water where the tree is overhanging the edge of the pond. This image should definitely be printed and displayed!!! A lovely autumn scene, and I like how the line of the pond leads us through the image. Well seen.